To celebrate the lives of Derek Francis and Right Revd Peter Nott. 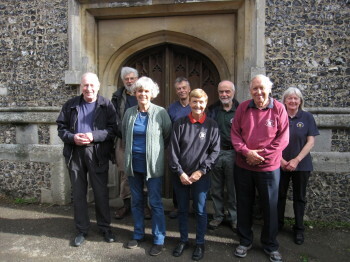 Derek was the Tower Captain who in the 1970s was the driving force behind the bell restoration project and Peter Nott (Rector at the time) embraced the project. Both died in August. Roy Woodruff, David Cornwall and Alison Bayley would like to be associated with this peal. Last updated Sunday, 14 October 2018 at 08:22:05. First submitted Saturday, 13 October 2018 at 15:45:17 by Kenneth J Darvill. Sent for publication in The Ringing World on Saturday, 13 October 2018 at 15:58:42, and printed in issue 5609, page 1036. This performance has been viewed 878 times.